Yvonne Brill, inventor of a propulsion system to help keep communications satellites from escaping their orbits in the early 1970s, died at the age of 88 on March 27, 2013, of complications from breast cancer. Yvonne Brill receiving the National Medal of Technology and Innovation from President Obama in 2011 (Credits: Win Mcnamee/Getty Images). Yvonne Claeys was born in 1924 to parents who immigrated to Canada from Belgium. At university, she was not allowed to take an engineering program; she studied mathematics and chemistry instead. She met her future husband, research chemist William Brill, while selling chemicals at her first job: they married in 1951. Although she did not have an engineering degree, she got a job with Douglas Aircraft in California. Mrs. Brill is believed to have been the only woman in the U.S. working as a rocket scientist in the mid-1940s, when she was employed in designing the first American satellite. Mrs. Brill, as she preferred to be called, followed her husband from job to job, working nights and weekends to make time to raise their three children. They moved to Connecticut in 1952 and then later New Jersey, but she always managed to find jobs that allowed her to continue to work on space applications. She worked at Wright Aeronautical until 1958, then as a part-time consultant for the FMC Corporation. In 1966, she took a job at RCA’s rocket subsidiary. In 1972, Mrs. Brill patented the work that won her international recognition – a satellite propulsion system. She developed a more efficient rocket thruster to maintain satellites’ orbits allowing them to carry less fuel and more payload, increasing also their operational life. In 1983, the first communications satellite using this system was launched; the system became an industry standard and is still being used by telecommunications satellites today. Mrs. Brill also worked on the propulsion system of Tiros, the first weather satellite, Atmosphere Explorer, the first upper-atmosphere satellite, and Mars Observer. From 1981 to 1983, at NASA, Mrs. Brill developed the rocket motor for the space shuttle. 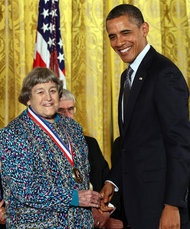 Mrs. Brill, among other awards, received in 2011 the National Medal of Technology and Innovation from U.S. President Barack Obama. Through her example, she encouraged women to become engineers and scientists and almost till the last moment, she was still writing letters to recommend eminent women in engineering for professional awards.